•	For each question I’m going to describe the Situation, part 1. 1. The first thing you want to do when answering a behavioral question is describe a work related Situation or Task that you needed to accomplish. And be concise. 2. Then describe the Action you took. Don’t tell them what you might do or would do, but instead, tell them what you did. 3. And finally, describe what happened — the result. What did you accomplish? What did you learn? How much time or money did you save? And most importantly, does your result solve the problem you described in step 1? Special Notice: If you would like more examples of STAR / Behavioral questions, you’ll want to get the Complete Interview Answer Guide. 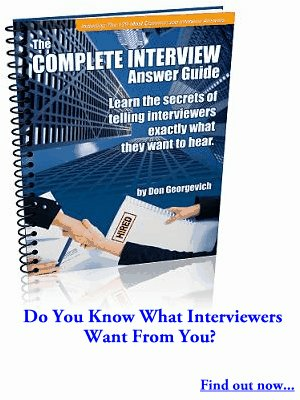 Inside the guide, I have over 130+ questions and answers to the most common questions you can expect to get asked on any job interview. The guide is available in PDF, Audio MP3, Video and hardcopy. You need to dig deeper. I encourage you to dig deeper and find out inside what it is about this company that attracts you so much. What is it? What do they do? Is it their culture? If it’s their culture, what specifically is it about their culture. If it’s their products, what is it about those products? You can’t just say, “Oh, I like them. They’re nice”. You need to dig deeper and to find a real compelling reason about what it is and why you are aligned with this company. But there’s another way; there’s a stronger technique to answering this question, “Why do you want to leave your job?” And it’s called the pull technique, but nobody uses it. Nobody even understands that it exists. And if you search on YouTube you probably won’t find anybody talking about the pull technique. That’s right; you heard it here first. If you think about it; a job interview, it’s not really a natural process. It’s just not natural to take somebody and stick them in a room with a couple of other people and have them ask them and probe them with all kinds of questions about things that they’ve done and experiences and how they would do this and that. It’s a very unnatural process. That’s why you feel so nervous. So, they’re kind of rude in that sense, and I don’t like those kind of employers or interviewers. I don’t think they’re intentionally being rude, but they’re kind of just ignorant of the fact that someone put a lot of time into something. They deserve a little bit more than silence. I mean, I think so anyway. when you blend in, you look like everybody else. When you go in there into the interview and you say all the same things that everybody else is saying, you answer all the questions in the same corporate way that everybody else is doing it.